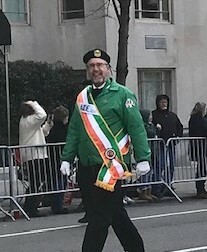 Attending the 2018 NYC St. Patrick's Day Parade Grand Marshal & Aide Reception supporting our own Orange County Aide Keith Reynolds. Awaiting the Big Man's arrival! We are also graced by the presence of our Division 1 NYS Rose of Tralee Candidate Tara Marie Goodwin! 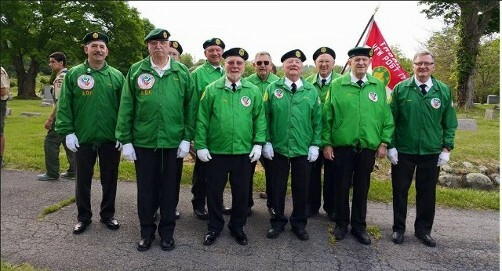 Memorial Day Celebrations were held in Goshen New York with sunrise services at 4 cemeteries and 2 monuments within the town. Prayers are said followed by a 21 gun salute then the playing of taps. 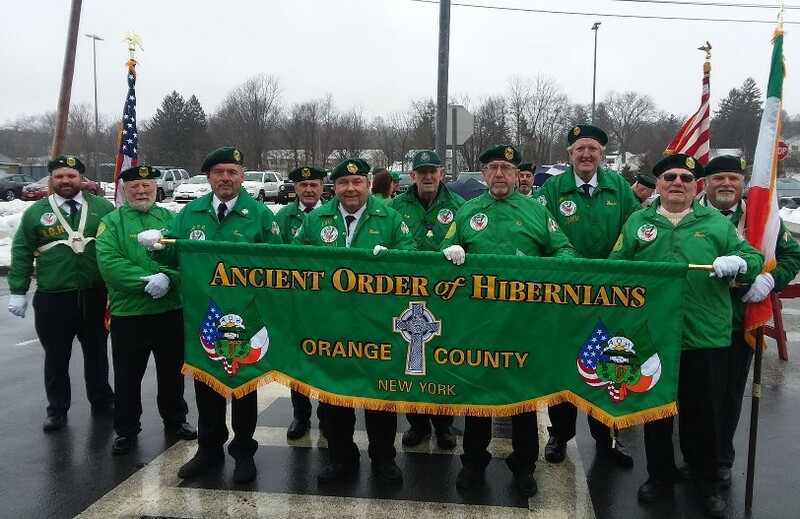 Members of the Orange County AOH attended the services. 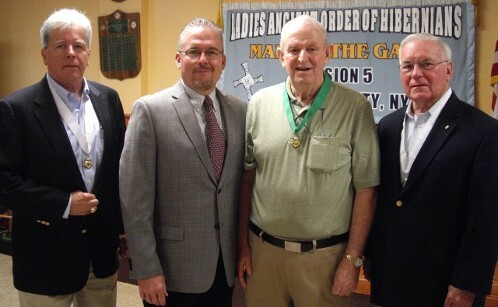 Pictured front (left to right) John Kennedy, Rich Collins, Ron Heppes, Ray Patterson and Pat (Buddy) McKernan. Rear row (L/R) Bob Burns, Pat Lahiff, Ed Burke and Kevin Dooner. 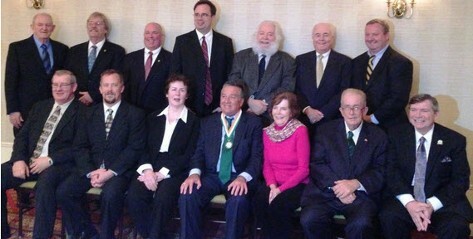 To memorialize the contributions to Hibernianism in New York State by Past Presidents John M. Burns and James F. Hayes, The New York State Board, Ancient Order of Hibernians in America, shall award biannually, an appropriate award to a resident of the State of New York, living at the time of the voting. 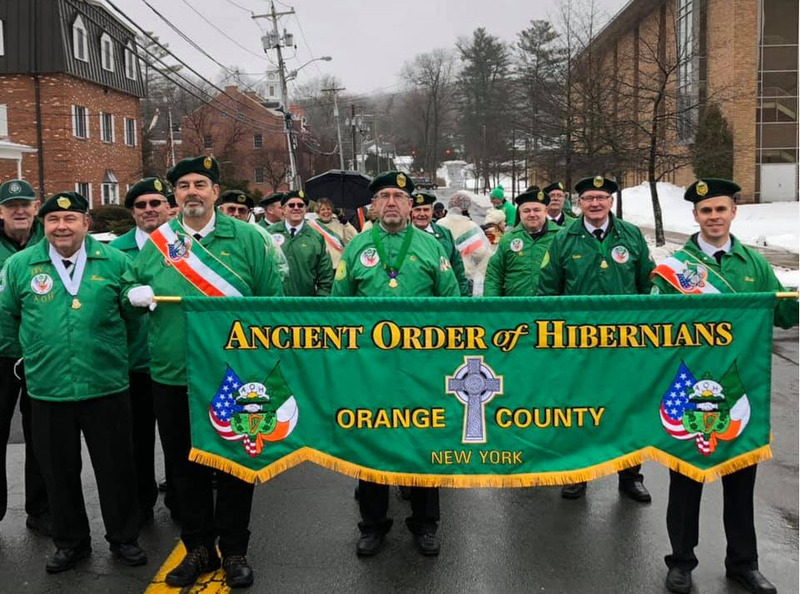 There will be no limits as to religion or membership in the Ancient Order of Hibernians. 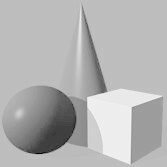 Nominee must be someone that espouses the causes and ideals of the Order. This award is to be named the Burns- Hayes Award. This year's Burns-Hayes winner is Life Member James J. Kelly of Joseph D. Duelk, Jr., Division 1, Monroe, New York. 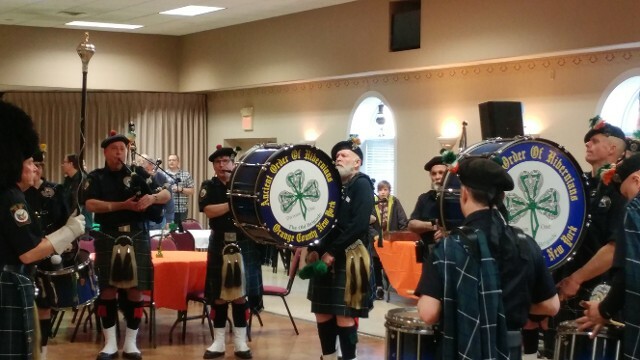 The announcement was made at the spring meeting held in East Durham in May. 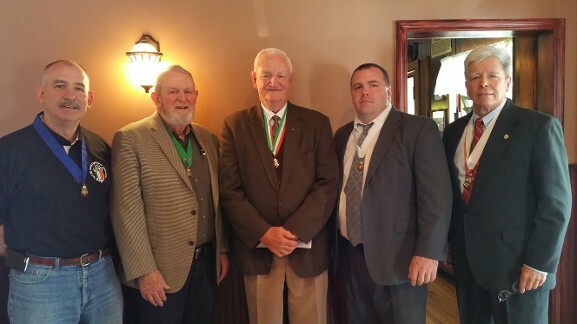 Pictured from L to R is George Anderson Past President of Division 1, Tom McDonald Orange County President, James J. Kelly, Tim McSweeney NYS President and Vic Vogel NYS Vice President. Award Presentation will take place at the November New York State President's Testimonial Dinner. Brother James Kelly, Past President of Division 1, Past President Orange County Board and Past District Director was presented with the AOH National Life Membership at the Orange County Board Meeting in December. 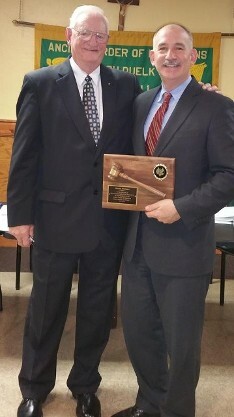 An award was presented at the December meeting and Installation of Officers of the Joseph Duelk, Jr. 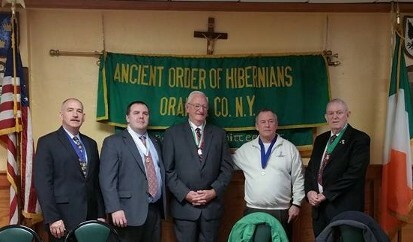 Ancient Order of Hibernians Division 1 in Monroe NY. Past President and recent recipient of the AOH National Life Membership, Brother James Kelly presented on behalf of the Division, a commemorative plaque to now Past President George Anderson. It has been a year of transitions and here is the latest...on Friday, I passed the gavel and mantle of leadership of Joseph Duelk, Jr. 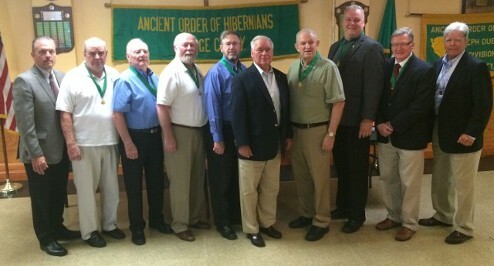 Ancient Order of Hibernians Division 1 in Orange County on to our Worthy Incoming President Thomas Flynn. I am proud and honored to have served these last two years as President of Division 1, and look forward to an active role as Immediate Past President. I want to thank Past President Keith Reynolds for choosing me as his Vice President and for all his support. I also thank my Board for all their hard work over the last 2 years. Incoming President Tommy Flynn and his Board are the right mix of talent and dedication to bring the Division to even greater heights and I wish them well. It was also an honor to receive a commemorative plaque from Tommy, presented by our Life Member and True Gentleman, Mr. James Kelly. The plaque and presentation were the highlights of my night. To all, thanks for the honor of being President, and all your kind words. 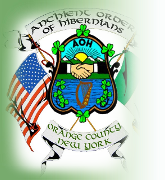 On December 4th, ten copies of the book entitled “The Road to Rebellion” by AOH Historian Mike McCormack were donated to the Goshen Public Library and Historical Society by the Orange County Board of the Ancient Order of Hibernians. The Road to Rebellion is an illustrated account of the causes leading to and the events during the Easter Rising of 1916 in Ireland. The AOH will be celebrating the upcoming centennial of the Easter Rising which led to Ireland’s independence. 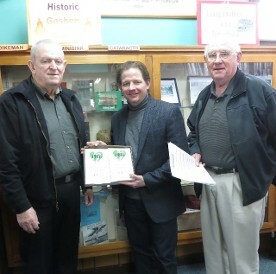 Accepting the donation was (center) Matthew Gomm – Director of the Library. 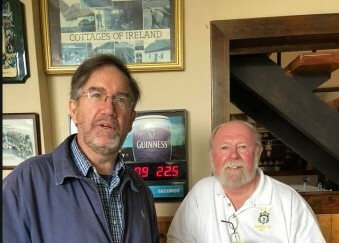 Presenting the books were (left) Thomas McDonald President of the Orange County AOH and (right) Patrick Lahiff, Orange County AOH Freedom for All Ireland Chairman. The library is part of the Ramapo Catskill Library System, serving public libraries in Orange, Rockland, Sullivan, and Southern Ulster Counties, New York. The books will be available to 51 libraries within the system. 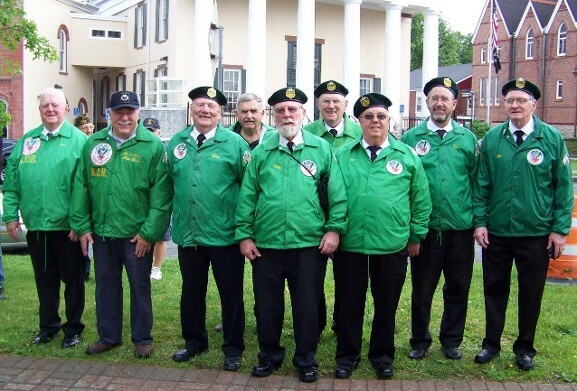 Memorial Day 2015, Goshen Sunrise Services at several cemeteries and monuments. L to R George Anderson(President Div. 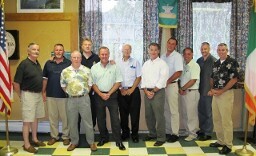 1) Tom McCarthy, Ed Burke (behind Tom) Mike Cummings, Ray Patterson, Robert Burns, Ron Heppes, Pat Lahiff, Tom McDonald and Kevin Dooner President Div. 4). 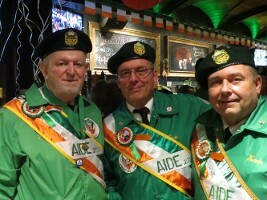 New York, NY, December 7, 2012 - The Aides to the Grand Marshal for the 252nd New York City St Patrick’s Day Parade were announced at the December Parade Delegates meeting in the New York Athletic Club in Manhattan by Parade Chairman John Dunleavy. 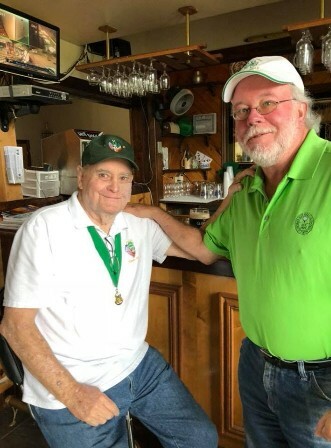 Aides to the Grand Marshal are chosen annually by the Parade’s participating organizations in recognition for their outstanding service to the Irish American Community. 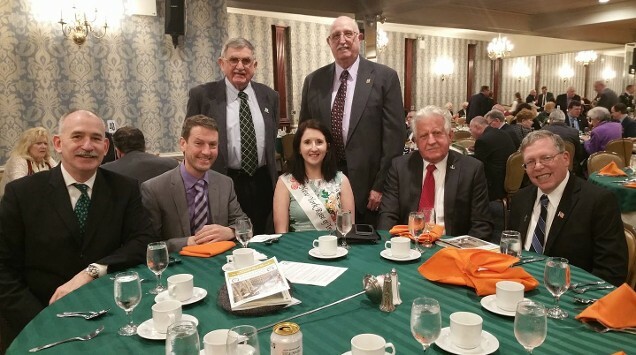 “One’s selection as an Aide is acknowledgment of years of unselfish, dedicated and distinguish service to the New York and Irish communities plus it is the acknowledgment of their contribution to Irish Faith, Culture and Heritage’ said Hilary Beirne Parade Executive Secretary. 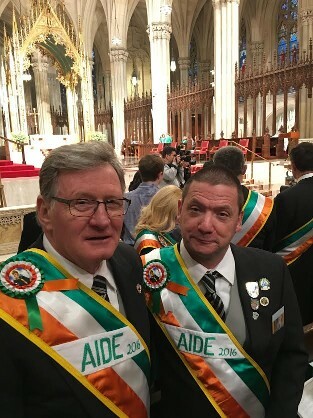 “We are extremely happy to recognize this year’s outstanding individuals who have been selected Aides to the Grand Marshal for the 252nd Parade’ said John Dunleavy to a large audience of delegates from across the Tri-State area.. “They will lead us proudly up Fifth Avenue along with the Grand Marshal Alfred E. Smith IV on Saturday, March 16th” said Dunleavy. 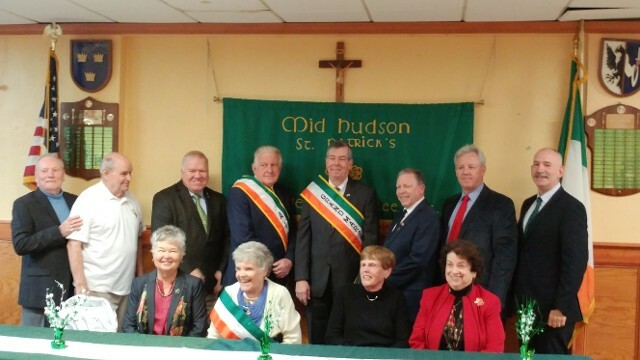 The Aides to the Grand Marshal for the 2013 Parade will be New York County - Pete Coyle, Bronx County - Bob Nolan, Queens County - Arthur Warren Scullin, Kings County - James J. Sullivan, Richmond County - Michael McVey, Nassau County - Jim E. Henry III, Suffolk County - Delia Byrne Weissenberger, Westchester County - James P. Walsh, Rockland County – Chris Cawley, Orange County - Thomas R. McDonald (Top Row - Left), United Irish Counties - Kathleen Keegan Mattessich, Grand Council of Emerald Societies - Robert J. Creighton, The Knights of St Patrick - Paul Hurley, The Aide at Large - Pat Troy. 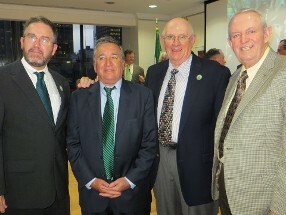 On September 9, 2012 at the Installation of the 2013 NYC St. Patrick's Day Parade Grand Marshal, held at the Irish Consulate, are members of Fr. Emmanuel Hourihan Division 4 in Middletown, NY. 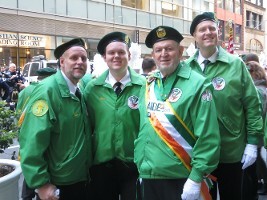 Pictured left to right, Edmond Burke, Honorable 2013 Grand Marshal Mr. Al Smith IV, Patrick Lahiff and Tom McDonald. A Memorial Garden was built on the grounds of Fr. Donald J. Whelan - Division 2 at the Irish Cultural Center in Cornwall, New York. 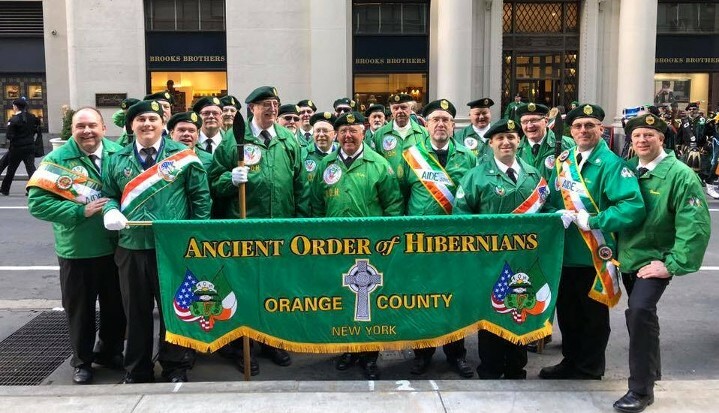 On September 15, 2012, A Celtic Cross was dedicated with a plack to remember those who lost their lifes in the Gorta Mór and in memory of all Deceased Members of Orange County Ancient Order of Hibernians. Enda Kenny (on left) Taoiseach or Prime Minister of Ireland with Kevin Cummings, President of AOH Orange County Board at reception held at the Irish Consulate in February 2012.